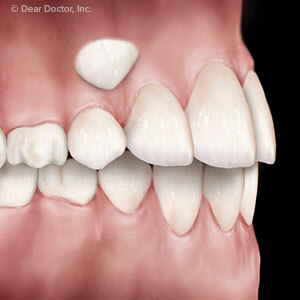 Although usually an orderly process, some permanent teeth don't come in as they should. In fact, they may not come in at all and remain hidden in the gum — a situation called impaction. This creates multiple problems for function, health and, in the case of front canines, appearance. Canines are the longer and more pointed teeth on each side of the front-most incisors. They help tear and cut food during chewing, a function impaction eliminates. Besides a higher risk for developing abscesses (isolated areas of infection) and cysts, they can also put pressure on neighboring teeth and damage their roots or cause them to erupt abnormally. Dentists often remove impacted wisdom and other back teeth to lessen these potential problems. Removing canines, though, has additional considerations: besides compromising ideal chewing function, missing canines often create an unattractive smile. But before considering removal, there's another technique we might be able to use to save the canines and actually draw them down through the gums to their correct position. It's usually part of an overall orthodontic plan to correct a poor bite (malocclusion). After pinpointing their exact position with x-rays or CT scanning, a surgeon surgically exposes the impacted canines' crowns through the gums. They then bond small brackets to the crowns and attach a small gold chain to each bracket. They fasten the other end of the chains to orthodontic hardware that exerts downward pressure on the impacted teeth. Over several months this pressure can help move the teeth into their normal positions. Unfortunately, this technique isn't always advisable: one or more of the impacted teeth may be in a difficult position to attempt it. It's usually best in these situations to remove the teeth, usually sooner rather than later for the sake of neighboring teeth. Fortunately, with today's advanced restorative techniques, we can eventually replace the canines with dental implants, although that's best undertaken after the patient enters adulthood. In the meantime, we can utilize orthodontic means to preserve the open space and provide a temporary restorative solution. Whatever route taken, these teeth don't have to become a source of problems, especially for your appearance. Whether through orthodontics or restorative dentistry, impacted canines don't have to ruin your smile.